The commander had turned to go when he heard a sharp curse from high in the branches in the tree. There was the sound of something else falling down through the leaves. With a cracking thud, the second Gadianti body fell, followed by a third, then a fourth... up to six in all. It was said that Benmin, the patrol commander and seasoned border veteran, paled when he looked back at the unconcious blue giant who had chased a Gadianti patrol up a tree and then sat and waited for them to either face him or die. "Take this one to the Captain directly. He needs to see this," was all Benmin was reputed to have said. 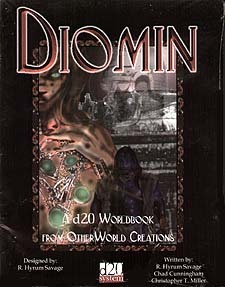 Diomin is a world governed not by science but by myth. It's a world where sorcery functions and the Gods play an active part in everyday life. Diomin lies at the juncture between the Spirit World and the Divine Realm, created by the One God to act as a bridge between the two. The result of this is sorcery and mortal life. To this very day Diomin is being fought over by the Gods. The Gods themselves live in the Divine Realm and interact with mortality through their representatives, as well as their magics. Those in the spirit World also have dealings with mortals, including powers and magics of their own. There is much to discover and much to accomplish as nations fight with nations and Gods scheme for control of mortality. Whole cultures are in the process of change, not knowing what the future holds. This book requires the use of the Dungeons and Dragons Players Handbook, Third Edition.